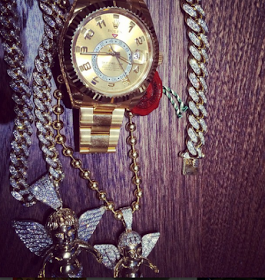 Wow..Wizkid recently shared a pict of his 5 Million Nine Hundred and Twenty Thousand Naira ($37,000) wrist Watch on twitter. Guess what people? It is real Man…Dat dude is making money …if he can really afford that. A fan called fake watch busta who confirmed the watch is 100 percent genuine. Big boy things!